Róisín Black (pink silks) and Casey Kavanagh (gold silks) from Drogheda, Co Louth, with Top Oil Mascot Mr Ted. 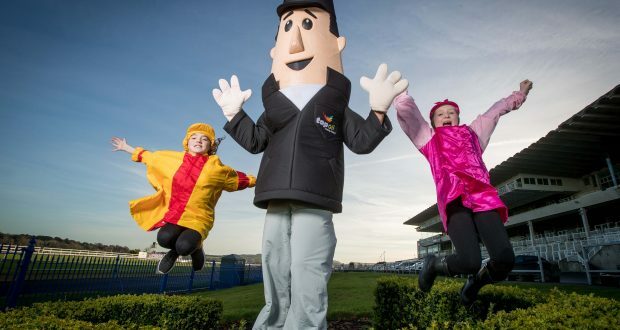 Top Oil is challenging companies across Ireland to pit their mascots against Mr Ted in a charity race later this month. The charity mascot race will take place on December 29 at the Leopardstown Christmas Festival. Each company involved will represent a chosen charity and the winner will award the total prize fund to their allocated charity. Each company entering the race must donate €500 to the prize fund, and compete for the prize money by entering its company mascot or designated character. Registered charities can also approach a company to ask them to represent their cause in the race. The 100 metre race will follow the Festival Finale Day of Leopardstown’s Christmas Festival, where over 10,000 patrons are expected to attend. All children under sixteen, once accompanied by an adult, can enter free and there are complimentary activities in the Marquee including bouncy castles, soft playzone, face painting and balloon modelling. After racing, Brian Kennedy will perform on stage in the Marquee. If your company is interested in participating in this fun challenge on behalf of a charity, contact the Top Oil team through its website, www.top.ie.